Listeners can visit the No Sounds Are Forbidden companion site for additional information, content, and playlists. No Sounds Are Forbidden - Episode 10 – Soir d’Hiver: The Spectacular Modernist Christmas Spectacular! No Sounds Are Forbidden is back with its tenth episode. Musicologist Jill Rogers (University College Cork) joins host Matthew Friedman for a holiday special exploring how modernist and avant-garde composers have marked Christmas in their music since the early 20th century. Read more about No Sounds Are Forbidden - Episode 10 – Soir d’Hiver: The Spectacular Modernist Christmas Spectacular! In the ninth episode of No Sounds Are Forbidden, “The Death of Europa: The Rise and Fall of the Inter-War Avant-Garde,” host Matthew Friedman explores the adventurous, and often chaotic street-level avant garde of Central Europe between the World Wars. In Berlin, Prague, and Vienna, radical composers, writers, and critics promoted a new vision of European culture that rejected the "immutable truths" of the Anciens Regimes. In the eighth episode of No Sounds Are Forbidden, “In Phase/Out of Phase: The Radical Simplicity of Minimalism,” host Matthew Friedman explores the American avant-garde's turn to minimalism in the late 1960s and 1970s. In the seventh episode of No Sounds Are Forbidden, “Music of Changes: Cage, Chance Operations, and Indeterminacy,” host Matthew Friedman explores the profound impact of the work and ideas of John Cage on the American avant-garde. Seeking to liberate sound from the restraints of conventional music, Cage introduced new compositional practice based on chance, and nurtured a generation of composers whose music was in a state of continual change. In the sixth episode of No Sounds Are Forbidden, “Synthetic Sound: The Second Electronic Music Revolution,” host Matthew Friedman explores sound synthesis, and how the invention of the electronic synthesizer inspired avant-garde composers, and transformed how listeners listened to music. This episode features music by Milton Babbitt, Morton Subotnick, Charles Wuorinen, Karlheinz Stockhausen, Raymond Scott, Gershon Kingsley, Tangerine Dream, Brian Eno, and Johann Sebastian Bach. In the fifth episode of No Sounds Are Forbidden, “Space Explorations: Avant-Garde Music in Three Dimensions,” host Matthew Friedman explores how avant-garde composers rediscovered the spatial nature of sound in the 20th century, and explored the three-dimensional implications of their music. This episode features music by Charles Ives, Erik Satie, Edgard Varese, John Cage, Karlheinz Stockhausen, David Tudor, and Henry Brant, as well as Giovanni Gabrielli, and Georg Philipp Telemann. In the fourth episode of No Sounds Are Forbidden, “The Tale of the Tape: The First Electronic Music Revolution,” host Matthew Friedman explores the impact of magnetic tape recording technologies on avant-garde composers, and on the birth of electronic music. 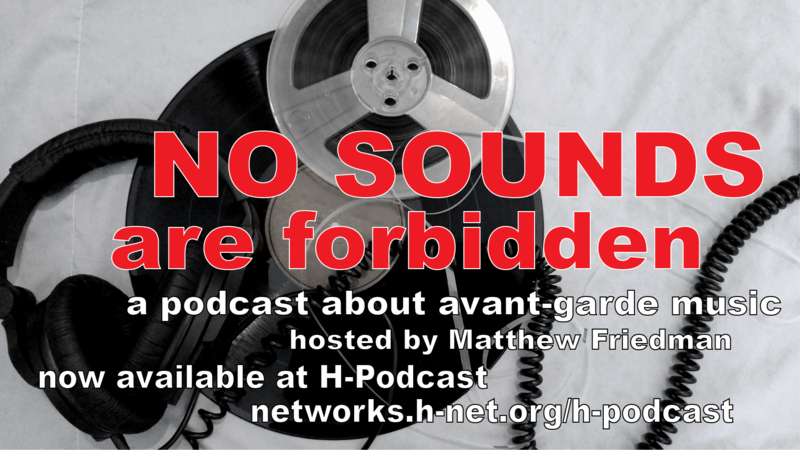 In the third episode of No Sounds Are Forbidden, “Listening in the Dark: The Avant-Garde at the Movies,” host Matthew Friedman explores the intimate connections between avant-garde music and cinema in the 20th, and 21st centuries. This episode features music by Gyorgy Ligeti, George Antheil, Norman McLaren, John Cage, Bebe and Louis Baron, Toru Takemitsu, Leonard Rosenman, Bernard Herman, Jerry Goldsmith, and John Adams. No Sounds Are Forbidden explores the complex and fascinating history of the avant-garde art music of the 20th and 21st centuries.